In addition to bars of soap wrapped in plastic, the Holiday Inn Vilnius provided both liquid toiletries in miniature plastic bottles and in a wall dispenser. Please click on the photograph for a review of this hotel property. Photograph ©2017 by Brian Cohen. Whether or not plastic tubes are also affected by the proposed bill is unclear at this time. …and you will likely see that familiar triangular arrows symbol of the Resin Identification Coding System, which is a standard as specified by the American Society for Testing and Materials pertaining to recycling. For both of the bottles shown in the above photograph, the resin code is for polyethylene terephthalate, which is nicknamed by the more familiar acronym known as PETE. All miniature plastic toiletry bottles for personal care products — such as shampoo, conditioner, body lotion and mouthwash as four examples — should be required to be manufactured by one recyclable material which had already been recycled. Perhaps that material can be based from a plant to be even more friendly to the environment. Please click on the photograph for a review of the Delta Hotels Banff Royal Canadian Lodge, which is where this blue recycling receptacle were found. Photograph ©2017 by Brian Cohen. Lodging establishments should then be required to provide a receptacle in guest rooms especially for recyclable materials. Once the guest is finished using the product, he or she then properly disposes of that bottle into the appropriate receptacle. Many hotel and resort properties around the world already have a similar system in place — such as the Delta Hotels Banff Royal Canadian Lodge, at which I stayed. Some people who are concerned about the environment would suggest that most — if not all toiletries — should be in solid form instead of as liquids in order to eliminate the need for small plastic bottles. For example, soap is still supplied in the form of solid bars at many lodging establishments instead of body wash in miniature plastic bottles; and they usually are packaged in cardboard boxes, which are easy to recycle. Please click on the photograph for a review of the Hyatt Place Richmond/Chester hotel property, which is where these bars of soap wrapped in plastic were found. Photographs ©2018 by Brian Cohen. One problem is solid products which come wrapped in plastic, which usually cannot be recycled — but plastic wrap arguably better protects the product which is contained in it. If possible, a happy compromise would be to seal solid toiletries in a material that gives as much protection to the product as plastic, but can be easily recycled like cardboard. Not everyone likes them, but certain shampoos and other products which are usually liquid in nature come in powdered form. Package them similarly in a recyclable material could also be another solution. Are Wall Dispensers The Answer? Please click on the photograph for a review of the Aloft Seoul Gangnam hotel property, which is where these wall dispensers were found. Photograph ©2014 by Brian Cohen. 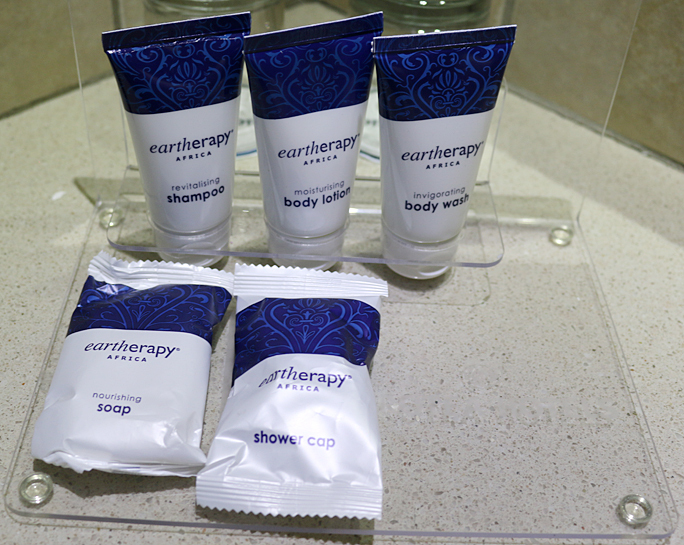 You may check into your room and notice that the familiar miniature plastic toiletry bottles are missing. Rather, dispensers are installed on the walls in the bathroom. Because there is only so much room on the walls of the bathroom — as well as for aesthetic reasons — instead of separate products for the shampoo and conditioner or for shampoo, liquid soap and body wash, they are combined as one product in a single dispenser. There was no more shampoo or soap in the dispenser in the shower — but I found out too late while I was already attempting to shower. Please click on the photograph for a review of the Park Inn by Radisson Budapest hotel property. Photograph ©2014 by Brian Cohen. Another issue is that dispensers are not always replenished — especially if the dispenser is manufactured out of a translucent or opaque material with no clear indicator. This has happened to me more than once over the years whenever I attempted to take a shower. For example, once was at the Park Inn by Radisson Budapest hotel property, at which the dispenser mounted on the wall was clearly empty — unlike the other time at a Holiday Inn hotel property in Munich, at which a dispenser mounted on the wall was empty; but one could not determine whether it was full or empty due to the fact that it was opaque with no indicator. The last thing I want to do is call housekeeping and wait until a member of the staff is good and ready to provide the product which I need to clean myself. I do not want to have to check if a wall dispenser has enough product whenever I want or need to use it. These dispensers were on the walls of the bathroom at the Tru by Hilton Oklahoma City Airport. Please click on the photograph for a review of this hotel property. Photographs ©2017 by Brian Cohen. Some wall dispensers are not easy to use at all — such as those at the Tru by Hilton Oklahoma City Airport, at which I stayed. Among other issues, I did not like how the product came out of the containers, as you have to squeeze both sides of the container itself for it to come out. Squeeze gently as instructed, and nothing happens; but too much came out when squeezing slightly less gently. Despite multiple attempts, I could not find a happy medium. The container is poorly designed overall. They don’t get refilled properly and when they do get refilled hotels are more likely to use counterfeit products. And guests have been known to put stuff in them you wouldn’t want there. Even where there have been safeguarding locks in place I’ve had rooms where those weren’t locked. Just Another Way to Reduce Costs For the Good of the Environment? This wall dispenser is at the Holiday Inn Lisbon – Continental hotel property. Please click on the photograph for a review of this hotel property. Photographs ©2018 by Brian Cohen. She is correct. Marriott International, Incorporated already started switching to larger bottles situated in racks mounted on the walls of rooms in 450 hotel and resort properties at five different brands; and intended to expand to 1,500 hotel and resort properties in North America by January of 2019 — while InterContinental Hotels Group introduced bulk dispensers mounted on walls in the rooms of hotel and resort properties at four different brands last year. Are these lodging companies truly concerned about the environment — or are they using these initiatives simply to improve their financial bottom line? Perhaps the answer is both are true — and if so, is that wrong? …but although dispensers attached to walls in the bathrooms of lodging establishments could work in some cases, I am opposed to that being the norm for the aforementioned reasons described in this article. Once implemented, some people will choose to ignore the recycling options which I have proposed in this article; and that is to be expected. All I know is that I recycle whenever possible; and if lodging establishments put forth an effort to help recycling be as easy as throwing something in a trash can, then the majority of guests should theoretically use them with no problem. As for toiletries in solid form: if a guest uses the product and likes it enough to keep it, that person can easily transport it home aboard an airplane, as it would not be subject to the limitations of liquids imposed at airport security checkpoints. Protecting them in a recyclable product which is both sealed and resistant to water would be a winning solution. As I reported in this article on Earth Day, Sunday, April 22, 2018, thousands of bars of used soap — as well as small plastic bottles of toiletries such as shampoo, conditioner, body lotion, mouthwash and skin cream — can be discarded from one single hotel property daily; and wall dispensers could help to significantly reduce that waste. I also like the idea of helping people to whom cleanliness is considered a luxury, which is where the aforementioned Clean the World Foundation comes in. Regardless of whether a hotel property uses wall dispensers or small bottles and tubes of amenities is not going to significantly affect my trip either way. All I care about when I am a guest in a hotel room is that I am clean, comfortable, relaxed and refreshed while I am traveling. All photographs ©2014, ©2015, ©2017, ©2018 and ©2019 by Brian Cohen. You give yourself short shrift. You do care about the environmental “stuff” (thus the analysis), but are as stymied as the rest of us in creating a solution. What I meant by that statement was pertaining to how the toiletries are available to me when I am traveling, colleen — although I can understand the confusion in the way I worded it. Yes, I do care about the environment; but I took it as a given when I wrote that statement. Ban. Ban. Ban. Ban. and then Ban. That is always the solution. Land of the free, and all that. Straws and tiny toiletries are destroying the world. Maybe people should be more concerned about all the electronics they purchase every year and throw away a year or two later. True James, and perhaps those companies that manufacture those electronics would make them to last more than a year. it seems Apple devices are disposable…like razors. Not me, James. Instead of throwing out my electronics in the trash, I have recycled my electronics in the past at stores such as Best Buy at no cost. I bring my own soap and shampoo. If they give me packaged ones, I take them home and give them to my local service center for the homeless, which offers showers to its clients. As much as I hate liberal and green politics, I’ve always felt that it is incredibly wasteful to have these bottles get thrown away after one usage. They should, as you said, either be recycled or the wall dispensers should be used.